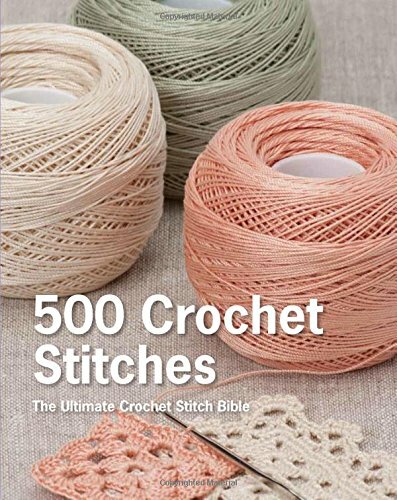 500 Crochet Stitches is both a stitch guide and a how-to-crochet primer, all in one volume. You get all the information needed to get started, including how to choose yarn and needles, read patterns, work basic stitches, how to check gauge, increase and decrease, join pieces and finish projects and care for your crochet items. The comprehensive pattern library includes 500 crochet stitches, including basic stitches using single and double crochet, trebles, and some new techniques to get the fabric you want for that special sweater or hat. Lace and openwork stitches are a starting point for exploring the airy shawls, and afghans crochet is famous for. Use one of the many motifs to create an heirloom blanket, or mix and match motifs to create a truly unique piece. There are also edgings and trims you can use on your crochet and other projects, including sewn items and knitted ones. Each is fully explained with instructions and accompanied by a full-color photo of a sample crocheted swatch. All swatches are worked in updated yarns, beautifully photographed and accompanied by easy-to-follow instructions. Based on The Harmony Guides, which have been a longstanding and valued reference for handcrafters for more than thirty years, with over half a million worldwide sales, this edition is updated with eye-catching photography and innovative new stitches, but also never forgetting the heritage of the guides. If you have any questions about this product by St Martin s Griffin, contact us by completing and submitting the form below. If you are looking for a specif part number, please include it with your message.